Carleton is announcing today that it is closing River City Books, the College-owned bookstore located at 306 Division Street in downtown Northfield. 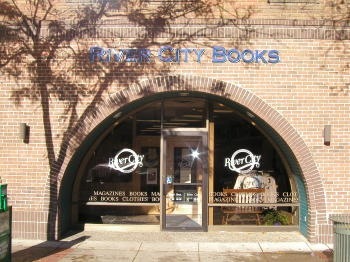 River City Books opened in March 2002 as a service and benefit to the Northfield community, but the lack of a positive bottom line ultimately led to the decision to close the store. The store has not met its financial goals, and after 6 ½ years of operation and in light of the economic downturn, it doesn’t appear that it will anytime soon. Despite the best efforts of our terrific staff and the generous support of our landlords, the store has not achieved the sales volume necessary to generate positive net income. The store, featuring more than 10,000 volumes, two levels and meeting space for book clubs and author appearances, is one of only a handful in Minnesota to earn designation in the “McSweeney’s 100” which identifies top independent bookstores. We’ve had tremendous literary interaction between the staff and the communities, including things like the River City book clubs, countless author appearances, fundraisers for education, the Harry Potter parties, our ‘By the Book’ literary page in the Northfield News, and the Northfield Reads! Community Book program (a collaboration between local booksellers and the Northfield Public Library). While the closing doesn’t affect Carleton’s on-campus bookstore, River City Bookstore employees’ status will depend on whether they are part time or full time and on their length of service with the College. The College anticipates closing the River City location sometime in the first half of 2009. If you have any questions or concerns about this announcement, please contact me. This is sad news on many levels. Although there had been rumors for years about the store’s generally respectable sales levels not meeting the demands of its unique cost structure, the understandable business decision is still painful to hear. Independent book-sellers have been under extreme pressure for years, with the internet, big box loss leaders, and, more recently, Griff’s Kindle. I recently watched a documentary called “Paperback Dreams” which told a similarly sad story about two of the greatest bookstores in American history succumbing to similar economic pressures. Many of us appreciate the investment made by the store’s owner, as we appreciate the investment made by all business owners, to pursue their dreams. The store was certainly appreciated by both residents of and visitors to Northfield. We are fortunate that we have two other bookstores on Division Street. Monkey See, Monkey Read and Bookfellows continue to swim against the currents, offering ink on paper and personal service for those of us determined to do it the old fashioned way. It is a tragic loss indeed. I hate to see one more shuttered store front downtown. Monkey… and Bookfellows will receive ALL of my business. Independent bookstores are so important to an educated, civil society. Bookstores never seem to have done well in Northfield (I lived there 1960-77, and my mother and sister live there now so I’m still somewhat in touch). It’s always seemed strange to me. I remember the first general bookstore, sometime in the late 1960s I think, by the river to the north of the bridge, under the street-level stores; I got some good science fiction there, but don’t remember the name of the store.